If you look at the architecture behind Intel's Quad core processors, you'll notice that numbers indicate a potential memory bandwidth problem with existing 1066MHz FSB based motherboard chipsets. Since quad core processors are set to be the mainstream CPU solution by mid-2008, Intel has had to up the Front Side Bus one more time. Coinciding with the release of 1333MHz FSB quad-core Intel Core 2 Quad processors is the 1333MHz FSB Intel P35 Express chipset. Potential bandwidth issue solved! At first glance the Intel P35 Express chipset looks remarkably identical to the Intel P965 Express mainstream chipset... but there are some subtle if not crucial differences. First and foremost is that the Intel P35 Express supports 1333 MHz Front Side Bus. This is critical for delivering the necessary bandwidth to a quad core Intel processor. Next, Intel has also increased maximum memory frequency from 800MHz to 1066 MHz, thus the theoretical maximum memory bandwidth jumps to 16GB/s when running in a dual channel configuration. Lastly, the Intel P35 Express chipset brings DDR3 RAM into the fold. Initially DDR3 memory will be rated to run at the same speeds as DDR2-1066 RAM, but you can expect DDR3 to eventually leave DDR2 in the dust by Q3'2008. Along with the Intel P35 Express Northbridge is a revised Southbridge chipset called the Intel ICH9. Between the previous Intel ICH8 Southbridge and the new Intel ICH9 are some slight upgrades and extra ports. The Intel ICH9 notably includes more USB 2.0 channels and a new technology called Intel Turbo Memory (ITM). The latter allows specific kinds of flash memory to be used as a buffer between the computer and HDD, which in theory should improve system performance. As of this writing Intel Turbo Memory has been postponed due to immature Ver 1.0 BIOS drivers which are not performing correctly. By 1Q'2008 the ver 1.5 drivers should be up and running and we'll see then if ITM has any real impact on PC performance. In this review PCSTATS is pleased to be testing the MSI P35 Platinum motherboard for you, from the outset it's quite a beaut! The MSI P35 Platinum is based on the Intel P35 Express and Intel ICH9R chipsets, and thus supports all Socket 775 processors on the market including the Core 2 Duo/Quad and Intel's upcoming Penryn quad-core processor (800/1066/1333MHz FSB). As is standard, the P35 Platinum has four DDR2 memory slots which can handle a maximum of 8GB of DDR2-800 memory. Note when JEDEC increases the DDR2 speed standard, the P35 Platinum will be compatible with that as well. 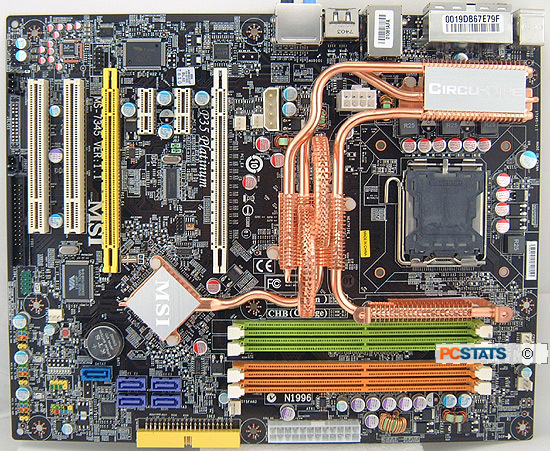 There is one DDR3-1066 version of this motherboard available as well, it is called the MSI P35D3 Platinum. 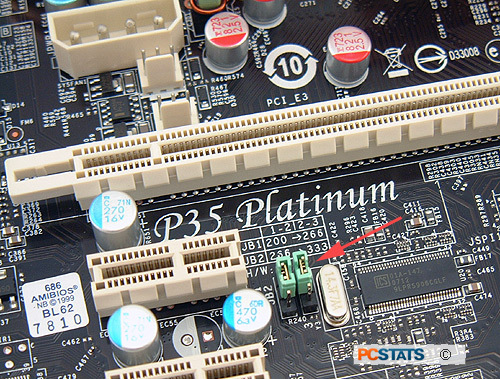 The P35 Platinum PCSTATS is testing in this review only supports DDR-2 memory,it cannot be upgraded to DDR3 RAM as the two memory types use differently keyed DIMM sockets which are not interchangeable. We'll get to that funky tangle of copper heatpipes you see below in a moment, but first let's see what the MSI P35 Platinum has to offer on the feature front. From the top, the P35 Platinum has dual PCI Express x16 slots which support ATI Crossfire, dual e-SATA jacks at the rear IO, the standard allotment of Gigabit networking, 8 channel High Definition Azalia audio, Serial ATA ports (five) with RAID (0, 1, 0+1, 5 and 10), IEEE 1394a Firewire and no less than twelve USB 2.0 slots! The board supports AMD's CrossFire technology, with the first videocard getting the full 16 PCI Express lanes while the second yellow slot is allocated 4 PCI Express lanes. 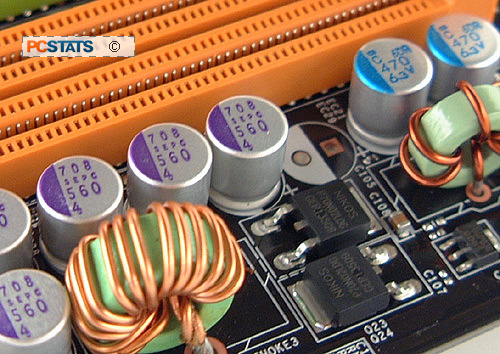 You may not notice, but the board also uses all-Japanese made low ESR solid state capacitors. These are much more reliable in the long term than electrolytic capacitors which have been known to burst or leak after a couple years. Peripheral expansion on the MSI P35 Platinum is accommodated by two PCI Express x1 slots for higher bandwidth devices and two 32 bit PCI slots for older hardware. There is one IDE connector for optical drives, and rounding things out MSI Dual CoreCell, Dynamic OverClocking, etc. The MSI P35 Platinum has a retail price of $214 CDN ($199 USD, £100 GBP), which is pretty competitive for this chipset class. The elaborate silent cooling solution on the MSI P35 Platinum motherboard is dubbed 'Circu-Pipe.' Heatpipes connect the Intel P35 Express Northbridge, ICH9 Southbridge and MOSFETs together so the components are all cooled uniformly. We'll get into all that shortly. MSI have opted for a legacy free rear IO layout on the P35 Platinum. Gone are the serial and parallel ports, and in their place four additional USB 2.0 slots, an IEEE 1394a Firewire jack, an optical audio connector and two eSATA ports. In the package we were happy to find drivers for both Microsoft Windows XP and Windows Vista. There is not bigger pain than sitting down to install a freshly built computer without the proper drivers on hand. Windows Vista is publicly available now, and all manufacturers should include drivers for that OS too! Installing the P35 Platinum is easy, most jacks are colour coordinated and the and front panel I/O headers even have polarity indicated. Both the User's Manual and installation guide offer comprehensive instruction. The MSI P35 Platinum has a set of FSB jumpers. By default the motherboard detects what FSB your processor is supposed to run at, and allows for quite a high overclocking range. 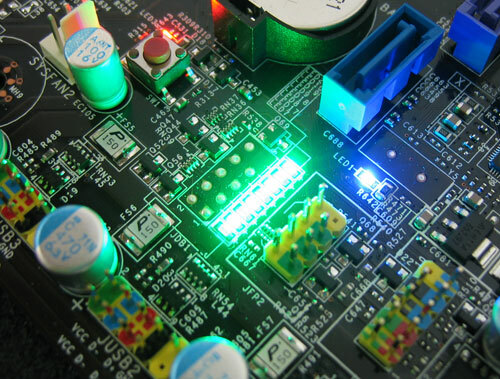 There are eight red and green LEDs on the lower right hand corner of the PCB of the P35 Platinum. These lights serve to indicate what is going on during the boot up process. If there is a CPU or memory problem, the LEDs will be lit in a special way. Refer to the manual and it will tell you exactly what is at fault. MSI use low ESR solid state polymer capacitors on the P35 Platinum motherboard because they have longer lifespan than the electrolytic variety. As temperatures increase inside the computer case, the lifespan of electrolytic capacitors begins to decline. Compared to standard Electrolytic capacitors which use a fluid electrolyte, the 'all-solid' style polymer capacitor lasts longer under the same conditions. The solid-state Low ESR conductive polymer capacitors are housed in very distinguishable aluminum cans, and will not burst or leak. Good capacitors will not make your computer faster, but they will ensure it runs reliably longer. The electro-conductive polymer capacitor does not use electrolyte, so they will not dry out, leak, or suffer gas buildup and burst. While the laymen may be challenged by such board-level component choices, the underlying point to walk away with is improved electrical reliability, decreased operating temperature, and increased motherboard lifespan. Next, a quick look at Intel's shiny new P35 Express chipset.